DVD ripping and video conversion gets more and more easier with the interface of video converter becomes more and more intuitive and makes the DVD backup and video transcoding divided into simply three steps: import source video, choose output format and start the conversion work. Then you can get desirable video to play on your multimedia players. Under what conditions you need a Video Converter Ultimate? ● You can’t play MKV files on your iPhone SE, iPhone 6S or iPad families. ● Your Open Hour Chameleon can’t handle your Blu-ray ISO images. ● Blu-ray disc can’t be recognized on PS4/PS3 for region codes. ● You need to copy 10+ DVD discs to Mini External Hard Drive for carrying with you when travelling. ● The audio go out of sync on your Apple TV 4/3/2/1 for wrong audio codec. ● Samsung TV not playing MKV’s via Plex. ● 4K video stutterring on VLC despite VLC claimed that it supported 4K. ● Need to make 3D SBS MP4 video for Gear VR out of 3D Blu-ray. Pavtube Video Converter Ultimate is an integrated Blu-ray Ripper + DVD Ripper + Audio Converter software. It is a most valuable investment. With it, you can explore the video and audio world without limitation, never needing to worry about the format and codec compatibility issues. Rip Blu-ray/DVD to digital versions or backup Blu-ray/DVD to ISO. Transfer Blu-ray/DVD movies to devices for viewing directly. Switch video format to another one encoded different codecs. Convert audio to another codec. 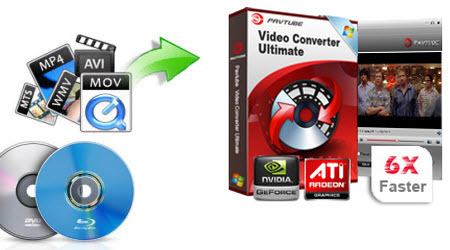 Any Video Converter Ultimate vs Pavtube Video Converter Ultimate: Which Deserves Your Money? In a sense, Pavtube Video Converter Ultimate includes all the functions of Any Video Converter Ultimate at similar price. It can rip DVD to hard drive and convert video like Any Video Converter Ultimate. What’s more, it also can convert Blu-ray to digital files and stream video directly on iPhone, Android tablet/phone. It allows you to reset audio and video size, bitrate, frame rate, sample rate, codec, channel. You even can edit your video and Blu-ray/DVD movies such as trim, rotate, adjust effect, etc with Pavtube product built-in video editing tool.